Rev Richard Brunton of Living Hope Ministries. 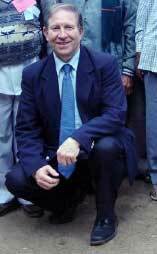 The Rev Richard Brunton was born in November 1949. However, it was as a 13 year old that he first found Christ as his Saviour. He attended a Baptist church in Fakenham, and found Norfolk was to present opportunities to preach - almost immediately after his conversion - in the open air in some of the surrounding Norfolk villages. Richard preached his first in-church sermon in a Railway Mission in Melton Constable, still only 15. Richard Brunton was discovering that God had a work for him to do and, although in so many areas he felt lacking and inadequate, he was joyfully discovering that God had a purpose for his life, and a work for him to do. At 17 years, he sensed clearly God's call to full time ministry, but it was to be 23 years later that the door opened for that. The Lord spoke about a big work in store that would involve speaking to crowds; but he never really took that in. While waiting, there were many doors of service, including spare and part time pastoring. Although waiting for full time ministry was difficult, Rev Richard Brunton knew that God had called him and had impressed upon him, as a teenager, the scriptures from 1 Peter 5 and 2 Timothy 4. The door through which he entered full time ministry was to prove a great challenge, and it was totally unexpected when the Lord took him to Africa in November 1994. He told Richard he was to do a "new thing". This "new thing", he discovered, would be working with many churches in the UK, rather than pastoring a church. This would support ministry in Kenya, Uganda, Tanzania and Rwanda, and has included Spain, New Jersey and Chicago. It involves writing to over hundreds of pastors and leaders, making television programmes and radio programmes. Sending Bible studies, teaching tapes and arranging seminars for pastors are all now a big part of Rev Richard Brunton's life. Most importantly, the new thing involves his wife, Elaine, and the boys. Their love and support is invaluable. 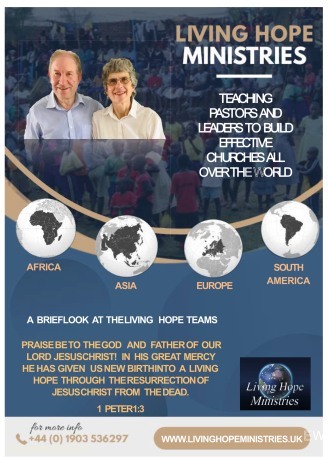 They hope you enjoy learning about Living Hope Ministries from this website, and that you will keep visiting it to see how the work is progressing.